Last October, when looking at the breathtaking growth in Chinese new debt, we pointed out the one segment where the danger was most acute: household debt, which in mid 2017 had surged by a whopping 43% in one year even as the growth across other debt categories was relatively stable. In fact, as the next chart shows, Chinese households are on the verge of surpassing the nation's corporations as the biggest source of credit demand. But what was behind the surge in household loan demand? As it turns out, it was merely the reality of China's surging prices coupled with stagnant incomes, forcing countless, mostly young Chinese residents to do what Americans have been doing for decades: charge it. In a report on China's brand new infatuation with consumer credit, the FT highlights the case of Tom Wang, a graduate from a middle-ranked Chinese university, who struggling to find well-paid work after arriving in Shanghai turned to the only possible source to fund his spending: credit cards. “Using credit cards did not feel like spending money, and the debt grew and grew,” said the 26-year-old, whose starting salary of Rmb3,000 ($470) a month could not cover rent and the consumption habits he called “irrational”, such as buying the latest smartphone. To cover repayments and keep spending, Wang took on more debt, borrowing Rmb60,000 over four credit cards , before turning to online lenders for a further Rmb70,000. The problem is that interest payments quickly “snowballed” to an untenable Rmb1,500 a month, eating up half of his entire pretax income. Rejecting the thrifty habits of their elders, Wang is part of a generation of young Chinese consumers who - very much like their American peers - have become used to spending with borrowed money. As a result, as shown in the chart above, outstanding consumer loans - used for vehicle purchases, holidays, household renovations and buying expensive household goods - grew nearly 40% last year to reach Rmb6.8trilion. 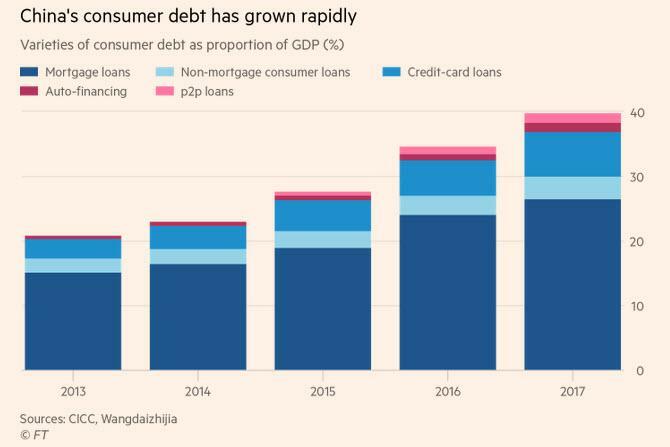 Combined with a rapid growth in mortgage lending, which makes up most of China’s household debt, consumer loans pushed household borrowing to Rmb33tn by the end of 2017, equivalent of 40% of GDP. And, as the FT calculates, the ratio has more than doubled since 2011. Seeing shades of US history repeating itself, some economists fear that the build up of household debt will hurt long-run consumption growth as consumers divert an increasing portion of their incomes to repayments. Large-scale defaults by consumers would put pressure on the solvency of lenders, potentially triggering a financial crisis. While hardly rocket science, the BIS recently warned that household debt can have "negative long-run effects on consumption", which intensify when borrowing exceeds 60% of GDP. The good news: China’s ratio of 40%, while higher than most developing country peers, is still below EU and US levels of 60 and 80% of GDP respectively. The bad news: the differential “could narrow quickly if left unchecked,” according to rating agency Fitch. 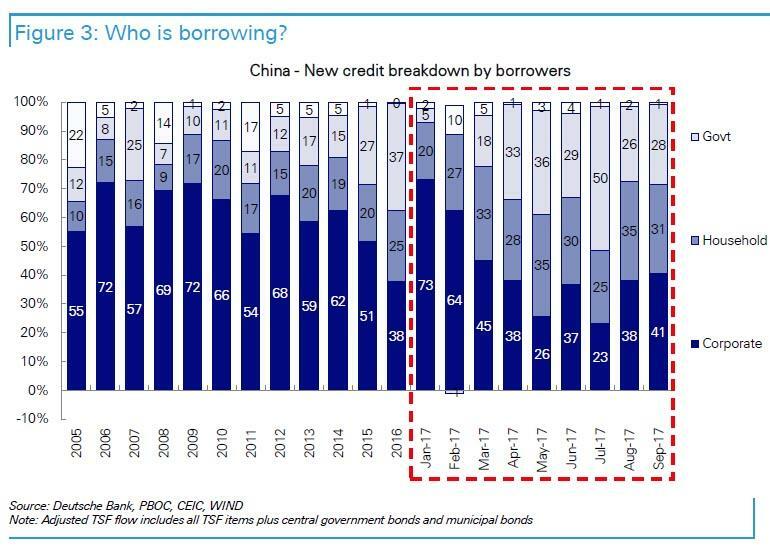 And in China, which recently ended its second brief infatuation with deleveraging as a result of the Trump trade war, debt growth is most certainly unchecked at this point, and at the current rate, consumer debt will hit 60% in about 2-3 years. For Beijing this loan-fueled spending spreed has been good news, if only for the time being: the surge in purchasing power - all on borrowed money - helped Beijing achieve its aim of making consumption the main driver of economic growth. And, as noted above, as Beijing pushed the corporate sector to deleverage, households became the largest recipients of new credit in China’s banking system for the first time last year. "It became harder to depend on the corporate sector to maintain growth. So the government thought it could use household leverage,” said Kaiji Chen, an economist at Emory University in the US. It's not just the local banks that are behind this tremendous debt tsunami: consumer loan growth has been accelerated by the emergence of hundreds of online peer-to-peer lenders who collect money from retail investors and dispense small loans to consumers, often without collateral. Banks have been reluctant to issue such loans due to the difficulties assessing the creditworthiness of individuals. Here a problem has emerged: as the FT reports, outstanding loans on P2P platforms rose 50% just last year to total Rmb1.2 trilion, according to industry monitoring service Diyiwangdai; due to their lack of collateral, interest rates often are as high as 37%, with additional charges for late payment. As for the core consumer, it's the usual suspects: it is all young men and women, in their twenties: "They feel peer pressure and the importance of investing in themselves . . . It could be English classes, vocational training, weddings, travel, or buying the latest iPhone,” said Benny Li, chief executive of platform Huaxia Finance. 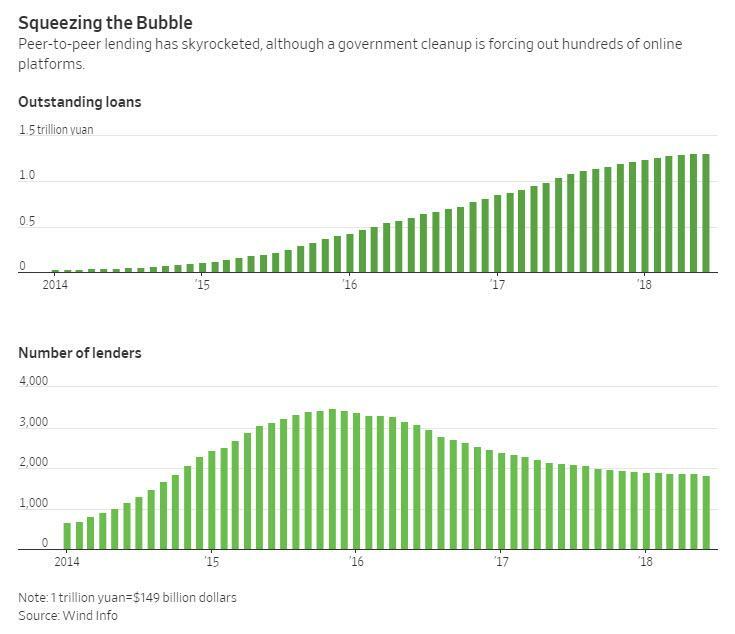 Meanwhile, China's peer-to-peer lending channel is not only getting clogged up, but is in reverse. In a recent article, the WSJ reported that a string of Chinese internet lenders have already shut their doors in recent weeks, stranding investors as the economy slows and regulators tighten controls over an unruly side of the fintech sector. Across China, more than 200 internet-based fund managers since late June have either shut down, closed parts of their operations or are reeling from cash crunches, missing executives and other problems, according to industry tracker Wangdaizhijia. The tide began to turn against the sector as an end-of-June deadline for new stringent registration regulations approached. With a slowing economy making it difficult for some companies to pay back loans, some lenders decided to shut down,. Investors, already souring on the sector, began pulling out funds, further pinching the lending platforms. The cascade of shutdowns caught Ji Zheng by surprise. The 31-year-old acupuncturist lost the 50,000 yuan ($7,438) he invested in Tourongjia.com when the peer-to-peer lender closed without notice earlier this month. This week, Yindou, a lender with whom he placed 77,000 yuan, shut too. “Everyone was trying to get out. It was too late,” he said Wednesday at a Beijing police station where he and other investors went to file complaints. The bigger problem is that aside from occasional anecdotes, nobody really knows how bad the potential P2P hole could be: The FT notes that aside from a central bank database that provides limited information, China lacks credit data on consumers. While the average US consumers’ credit history dates back 14 years, in China “you are lucky to have a few months — this is our challenge”, said Huaxia's Benny Li. “Where we are today is probably similar to the 70s or 80s in the US when Sears and JCPenny were issuing credit cards,” he added. China’s first unified private personal credit information service, Baihang, launched in February and has signed up 15 platforms, but most still perform their own checks. Huaxia relies on telephone records and calls to applicants’ relatives, said Mr Li. Other companies claim to use AI systems to scour customer’s social media contacts to detect their creditworthiness. Even with incomplete data, it is estimates that non-performing loans among China's P2P platforms are about 8% on average — four times the official figure for the banking sector; the real number, of course, could be substantially higher. In fact, According to Lu Weiting, CEO of consumer debt collection company Cuimi Technology, the NPL ratio for the P2P sector could be as high as 15%, according to Mr Lu. And the real punchline: the proportion of overdue loans is even higher, at a staggering 50%, often due to fraud. This means that up to half of China's massive P2P-issued debt could be in default in the very near future, crushing personal consumption in the process. Emory University's Chen estimated that China’s household debt burden was equal to about 80% of total disposable income, "meaning consumption would collapse if households tried to repay all their debt at once." it also means that at the current rate of debt growth, if one throws in a little more rate increases, all of China's disposable income at the household level will merely go to pay interest on existing debt! While a wave of mass defaults will likely not be permitted by the government, a more realistic worry according to analysts is that with average mortgage maturity around 16 years, mortgage repayments will crimp consumption. Chinese households use nearly 17 per cent of their monthly income to repay debt, according to the China Household Finance Survey, up from 11 per cent in 2013. For low-income households, the percentage rises to 47%. For China, which only recently transformed into a consumer-driven economy, the result would be disastrous. That burden could “constrain other forms of consumer discretionary spending and enfeeble authorities’ efforts to pivot the economy towards consumption-led growth”, according to Fitch. There are signs this already happening: retail sales growth slowed to 8 per cent this year, down from 12 per cent in 2013. Still, annual income growth in recent years has averaged around 7%, meaning many households will double their incomes over the next decade, assuming of course they don't see their debt burdens growth at a faster pace. The good news is that total household leverage is low, relative to bank deposits and other liquid assets, which amount to around Rmb147tn or 180% of GDP, according to CICC. The bad news, is that the bulk of these deposits would flee if China removed its capital controls - as we saw in 2015 - suggesting that the current equilibrium is highly unstable. Meanwhile, China's P2P lenders have on final hope: namely that their young borrowers — who are less burdened by mortgage debt but also have less savings to dip into — can avoid default by earning higher wages. For some, such as the abovementioned Wang, this is indeed the case: he recently found an IT job that pays in excess of Rmb12,000 a month. He owes just Rmb80,000 — which he expects to pay off soon. “If there are no other problems, I will reach the shore next year,” he said. However, if the track record of China's Millennial peers in the US is any indication, the vast majority of them will not be lucky enough to "grow into" higher wages, especially if the Chinese economic slowdown accelerates. Should that happen, those looking at China's corporations for the source of the country's next debt crisis would be surprised: the real ground zero of the next "pandora's box" will be China's 20-somethings armed with one, or likely many more, credit cards.